Leica Geosystems today announced additional features for the Leica mojoMINI and Leica mojo3D to further enhance product usability and compatibility. Upgrades include an improved look and feel of the mojoMINI display, data import and export for the Leica mojo3D and an extra lightbar option for both products. The 4.3 inch touch screen has undertaken several modifications. It now displays the speed on the main screen in km/h and mph to assist customers without a speed compensated rate control. Additionally the menu buttons vanish after 20 seconds of inactivity to provide a full screen view of the field. With a simple touch of the screen the buttons re-appear instantly. The Leica mojoMINI now offers two lightbar modes: the traditional cross track only lightbar and the Leica smart lightbar. Using the added cross track lightbar mode farmers can customize the distance from the line which is represented by each lightbar segment. Whereas the established Leica smart lightbar provides an easy to follow path to the line. For more flexibility the new WAAS/EGNOS activation control allows farmers to choose the use of WAAS and EGNOS satellites or to deactivate them, if desired. Plus, the added support for kml files gives users of the Leica mojoMINI the ability to export data of the most recent work, such as coverage, boundary and wayline, for viewing in Google EarthTM or import into a Leica mojo3D. 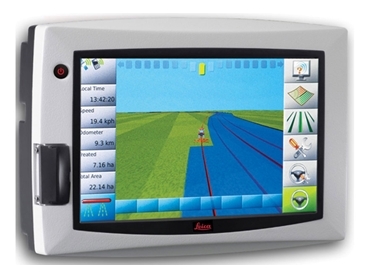 The latest steering update allows steering of all Leica SteerDirect kits which are supported by the Leica mojoXact, using just the Leica mojo3D and the Leica twist. To enable these extra steering options a Leica mojo3D SteerDirect kit is required. Like the Leica mojoMINI, the Leica mojo3D gained an extra lightbar option and now offers the cross track only lightbar as well as the Leica smart lightbar. To further increase the compatibility of the guidance display, the support for kml and shape files has been introduced. This makes it easy for customers to import and export field data and vehicle setups to another Leica mojo3D or different applications, e.g. SST Summit® or Apex TM. Furthermore the support of direct section control Agrotronix Pulvix 8X00 has been added to the range of section controls. All new features are available end of March.